A potaje is a thick bean stew that’s popular in Cuban cuisine; lentejas is Spanish for lentils. 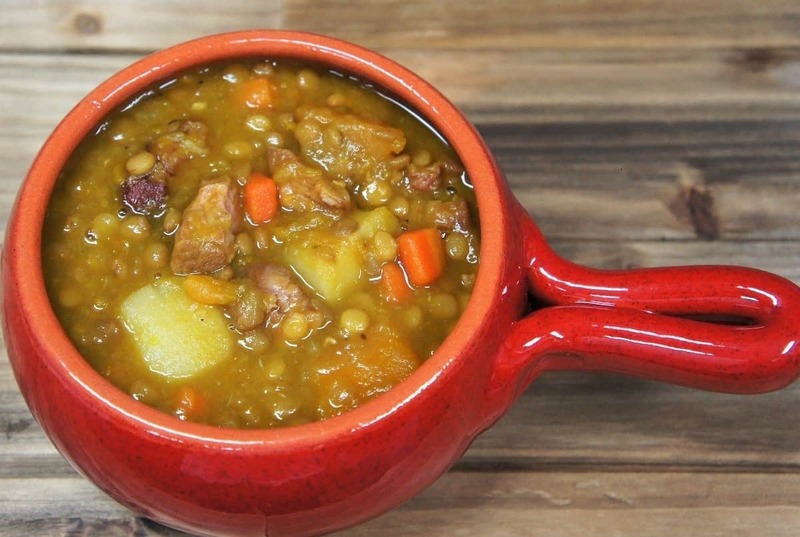 A potaje de lentejas is a hearty and flavorful lentil stew. Typical ingredients include beans, meat (usually an inexpensive cut) and vegetables. For this stew, we use lentils, ham shanks, potatoes, carrots and pumpkin. Plus we add aromatics and spices: onions, garlic, oregano, cumin and a bay leaf that flavor this stew beautifully. For more filling and delicious Cuban dishes, try this chicken fricassee, these Cuban-style red beans or this carne con papas recipe. Enjoy! Peeling a pumpkin can be tricky. They’re irregularly shaped and have a really thick peel. It’s much easier to do if the pumpkin is cut into pieces. First, scoop out the seeds using a large, sturdy spoon. 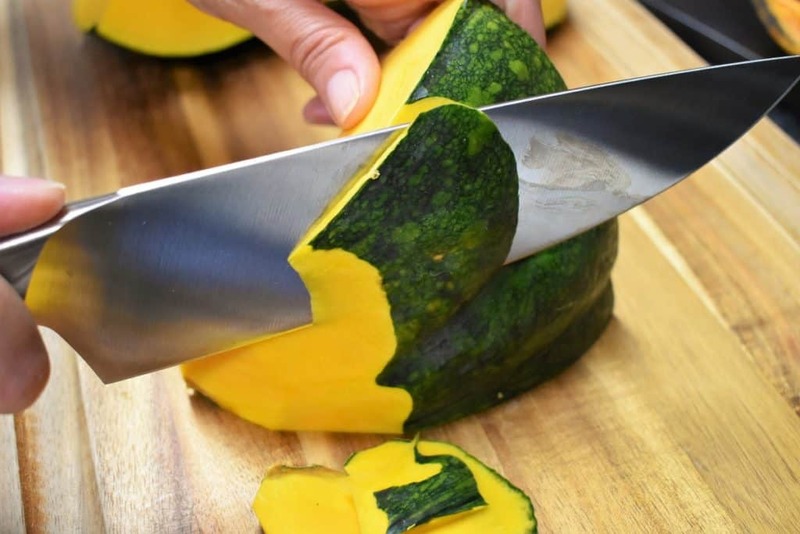 Then cut it into pieces and peel one piece at a time. Sort through the lentils and remove any foreign objects, like small stones. I frequently find small stones when sorting, they’ll put a hurting on a tooth, so don’t skip this step! Rinse the lentils and drain well. Rinse the smoked ham shanks or ham hocks. Typically, they’re super salty, making it hard to control the salt in the soup. Peel and dice the remaining vegetables and measure out the spices, broth and water. Now, you’re ready to make the potaje. Heat the olive oil in a large pot over medium heat, add the onions and carrots. Cook approximately 5 minutes until the onions are translucent, stirring frequently. Add the tomato paste, garlic, oregano, and cumin, stir well. Cook 1 minute, stirring frequently. Add the ham shanks, water and chicken broth to the pot, stir well. Raise the heat to high and bring the liquid to a boil. Lower the heat to medium-low, cover and cook 10 minutes, stirring occasionally. Add the lentils and bay leaf to the pot, stir well. Cover the pot and cook for about 20 minutes until the lentils start to soften, stirring only occasionally. Remove the ham shanks from the pot and set on a plate or cutting board. When they’re cool enough to handle, take the meat off the bones and trim the fat. Chop the ham and return it to the pot. Discard the bones and fat. While the ham shanks cool: add the potatoes and the pumpkin to the potaje de lentejas. Raise the heat, bring the liquid back to a boil. Lower the heat to medium-low, cover and cook for approximately 15-20 minutes, or until the lentils, potatoes and pumpkin are tender, stirring occasionally. 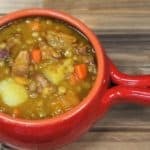 For more delicious lentil recipes, try this easy lentil sausage soup or deliciously different Italian sausage lentil soup. Potaje de Lentejas – a potaje is a Cuban-style bean stew. 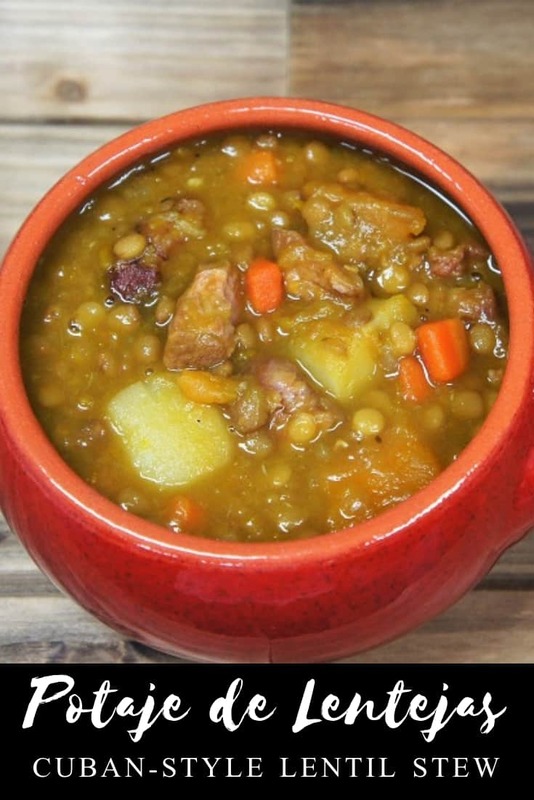 For this stew, we use lentils, ham shanks, potatoes, carrots and pumpkin. Plus we add aromatics and spices. Sort through the lentils and remove any foreign objects (like small stones), rinse well, drain and set aside. In a large pot, heat the olive oil over medium heat, add the onions and carrots. Cook 5 minutes, stirring frequently. Add the tomato paste, garlic, oregano, and cumin, stir well. Cook 1 minute, stirring frequently. Add the lentils and bay leaf to the pot, stir. Cover and cook for about 20 minutes until the lentils start to soften, stirring only occasionally. Remove the ham shanks from the pot and set on a plate or cutting board. When they're cool enough to handle, take the meat off the bones and trim the fat. 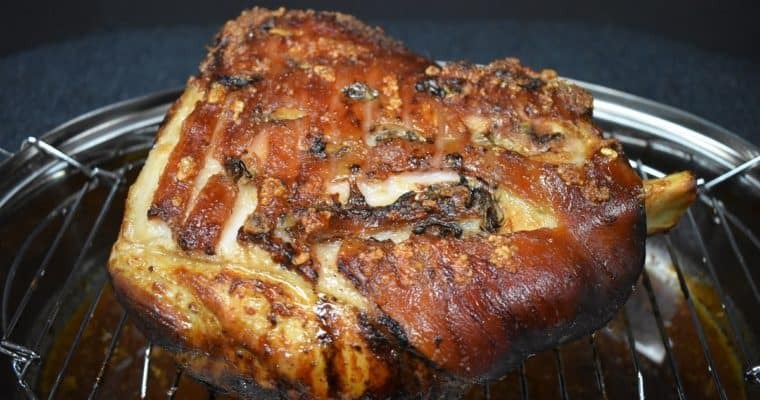 Chop the ham and return it to the pot. Discard the bones and fat. While the ham shanks cool: add the potatoes and the pumpkin to the pot. Raise the heat, bring the liquid back to a boil. Lower the heat to medium-low, cover and cook for approximately 15-20 until the lentils, potatoes and pumpkin are tender, stirring occasionally. Taste the potaje de lentejas and add salt and pepper to taste, if needed.